Movies are free and projected onto an 8 x 10 ft. screen using and LCD projector. Due to Production Studio guidelines the library may not include movie titles or studio names in its advertising. Please call the library for movie titles. English subtitles will be turned on for all films as a courtesy to those with hearing difficulties. Popcorn will be served; feel free to bring your own snacks and non-alcoholic beverages. English subtitles will be turned on for all films as a courtesy to those with hearing difficulties. Donations are always welcome. 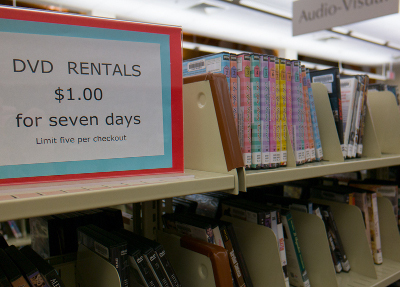 The Library has a collection of DVDs, VHS Cassettes, and BluRays that can be checked out if you have a library card in good standing. Videos are $1.00 and can be checked out for one week. Videos may be renewed one time in person or over the phone for an additional $1.00 charge. Rated PG; 1 hr. 53 min. A humble orphan suddenly becomes a gentleman with the help of an unknown benefactor. 1 hr. 58 min. ▸ View all Movies at Macon County Public Library.